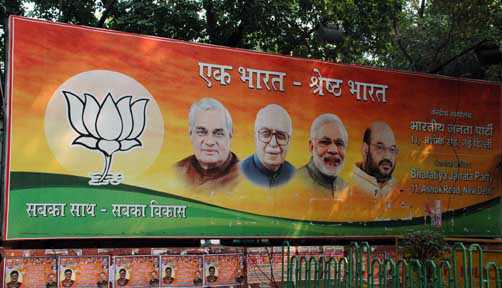 New Delhi: On the face of clear rout in Chhattisgarh and not able to put up a good show in other states, the BJP on Tuesday said the mandate in the recently held assembly elections will have no connections to the Lok Sabha polls next year. "There is no link between 2019 the assembly elections just held. In these elections, the clear mandate is in Mizoram where Congress has been decimated, in Chhattisgarh where we lost and in Telangana where Congress failed to make a mark with its partners", BJP spokesperson Nalin Kohli told reporters here. He also said party will be able form government in Madhya Pradesh and still hopeful of a turnaround in Rajasthan. Meanwhile, BJP's Rajya Sabha MP Sanjay Kakade sought to blame the party leadership and the star campaigners, especially UP Chief Minister Yogi Adityanath for allegedly derailing party's developmental plank for the poor show in the assembly polls.